"Hey Cameron, You realise if we played by the rules right now we'd be in gym?" Okay, here's a film for all you kids going back to school next year. If your ever wanting to skip/"wag" a day of school make sure that you make it as memorable as 'Ferris Bueller's Day Off'. On January 7 at 6 pm, Moonlight Cinema in Brisbane is screening a special film that will bring a whole new meaning to skipping school. 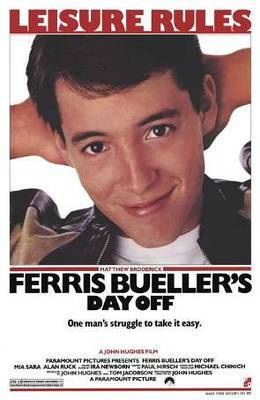 As Ferris (Matthew Broderick) is attempting to fake his 9th sick day of the semester, he plans to make it one to remember before he graduates. Alongside his best friend Cameron (Alan Ruck) and his girlfriend Sloane (Mia Sara), they intend to have the best day of their lives until the wacky principal Ed Rooney (Jeffrey Jones) is so obsessed with catching Ferris in the act that he is willing to go to unbelievable measures. While getting into all sorts of trouble and mishaps, including tricking the principal in order to relieve Sloane from the horrific walls of school, to borrowing Cameron's fathers Ferrari. These three drive to New York City where they have all sorts of crazy fun and wacky adventures.Visiting the tallest building within New York City, dining at a 5 star restaurant, identity theft, having an unbelievable accident with the prized Ferrari to watching a baseball match. While Ferris thinks that he knows all the tricks, does he know how to not get caught after all these events - which clearly do not go his way? "Maybe I'm overreacting. Maybe Ferris isn't such a bad guy. After all, I got a car, he got a computer. But still, why should he get to do whatever he wants, whenever he wants? Why should everything work out for him? What makes him so goddamn special?" Could this finally be the moment when Ferris is caught? Or will this be his triumphant glory day? Or will the preposterous Ed Rooney catch not only Ferris in the act, but his friends as well? All in all this film has been shot very well in its entirety. The film is directed by John Hughes (Pretty In Pink, Home Alone) and should be commended on the general idea that it is about kids being kids. This film will relive the kid within all of us. I award this a film a 3.5/5. For a night out with your family, attend the Moonlight Theatre on January 7 at 6 pm. This is a classic film which family members from all age groups and all social backgrounds can enjoy and relate to and laugh at least once, but for fans of the film, always remember "Life moves pretty fast. If you don't stop and look around once in a while, you could miss it".